I've had some time off lately for Christmas break and I am loving the fact that it has given me some more time to make jewelry and share my creations with you like this DIY Metal Charm and Chain Necklace! Of course Christmas break has been filled with lots of other Christmasy things as well :) My boyfriend and I split time between both of our families on Christmas Eve and Christmas day. It was great to see both sides of the family to eat lots of good food and squeeze in lots of BABY time too! I have three nieces now and the youngest one Felicity is 7 months old now. I bought her a dumbbell rattle (affiliate link) for Christmas - how freaking cute does she look with it??? She's making gainz already ;) We spent Christmas morning with my boyfriend's family, Christmas lunch/afternoon with my family, which then left us surprisingly free on Christmas night! It was actually kind of nice to have some time just the two of us: this was only our second Christmas together so we popped some bubbly, opened our own presents, and then cuddled on the couch. Perfect Christmas night for me! 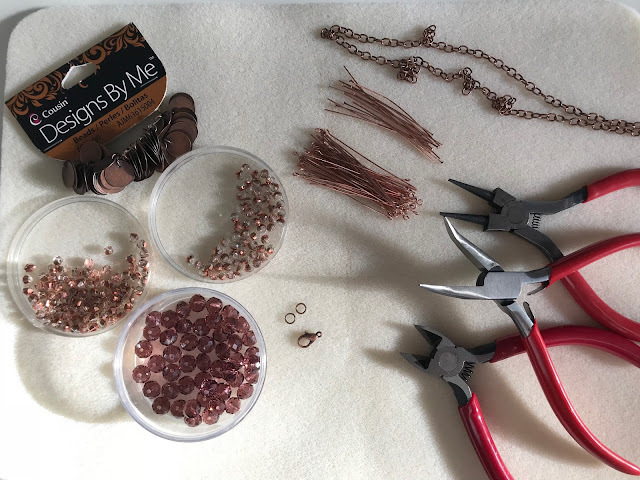 After all the festivities were over though I was back to my beading table. 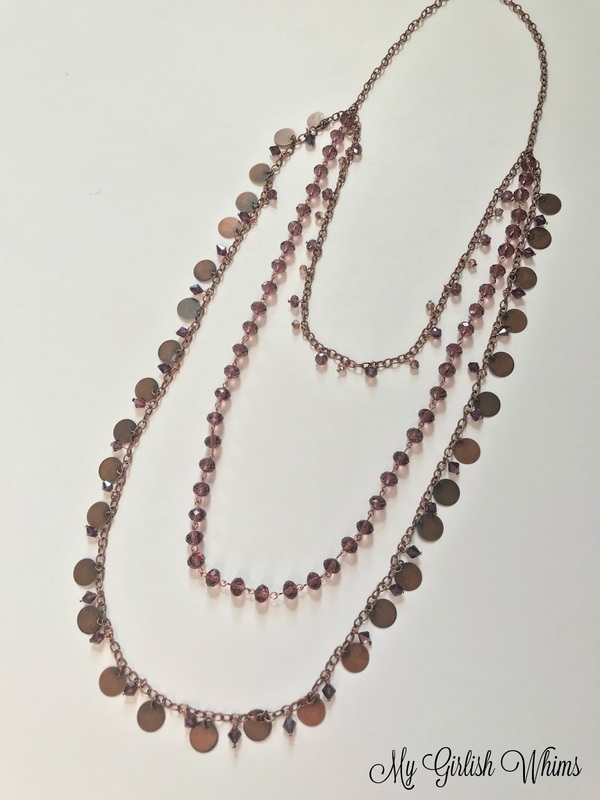 Before I can show you what I made over this break, I have to play catch up and show you one of my last creations! 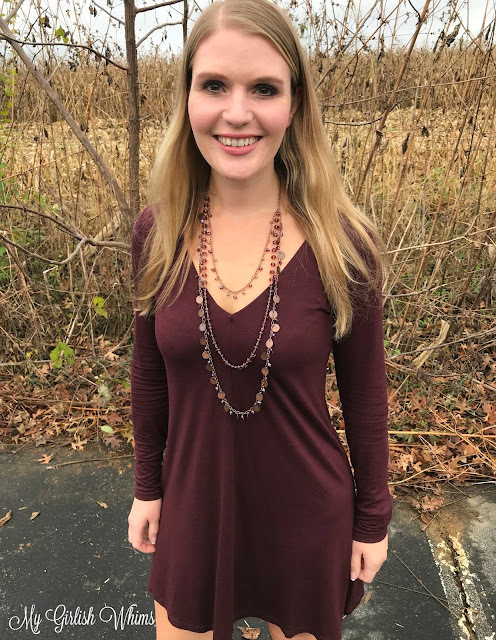 I recently grabbed this basic long sleeve t-shirt dress for less than $20.00 from Forever 21 and needed a necklace to wear with it to fancy it up a bit. 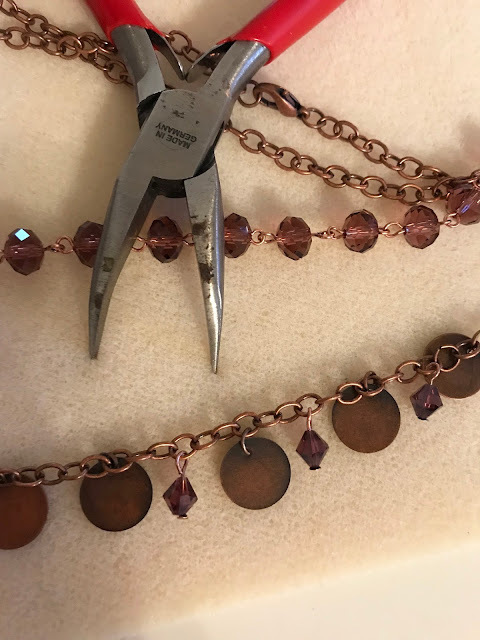 So out came the beading supplies and the design wheels started churning and here is what I came up with! An easy to make necklace that is flashy and sparkly enough to jazz up the dress but simple enough to still keep the outfit still semi-casual. 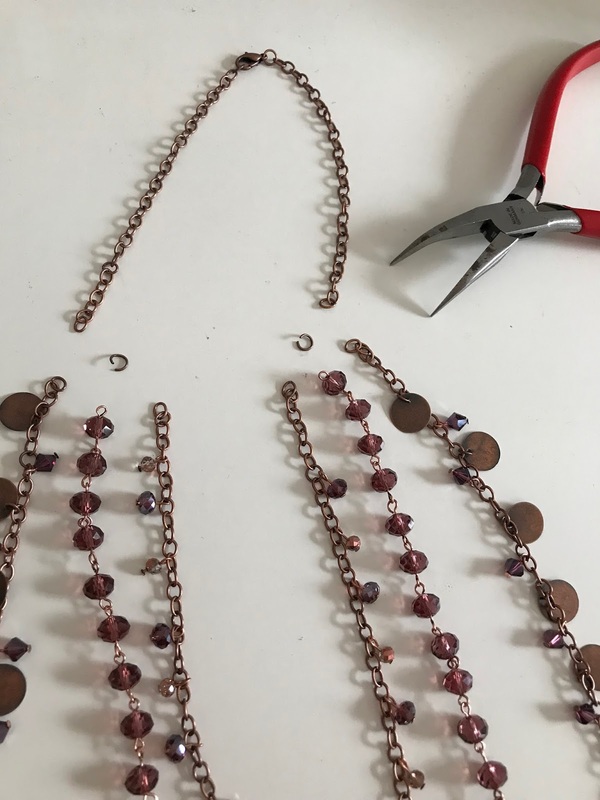 Here is how you can make your own version! 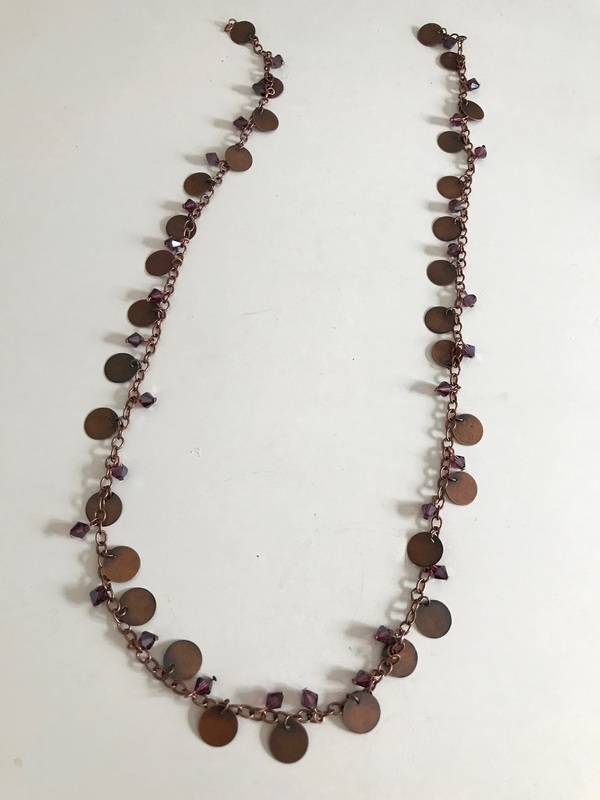 To make this necklace you will need 6mm rondelle beads, 3mm acrylic beads (I used both bicone and rounds), 6mm bicone crystals (not pictured), copper charm beads, copper chain, head pins, eye pins, jump rings, a lobster claw clasp, wire cutters, needle nose pliers and round nose pliers. 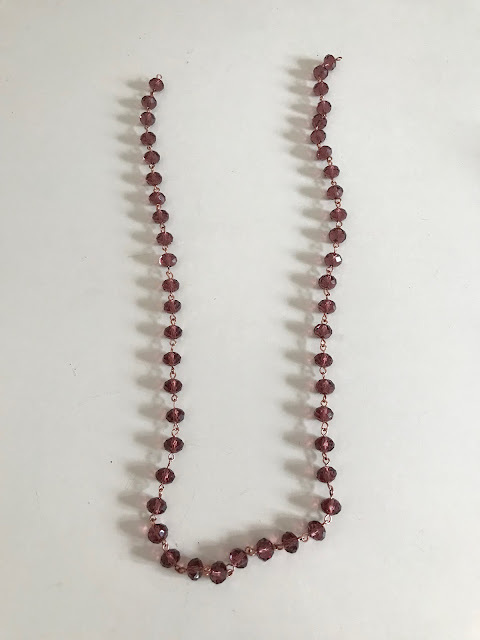 To make the first strand of the necklace start by stringing one rondelle bead onto an eye pin. 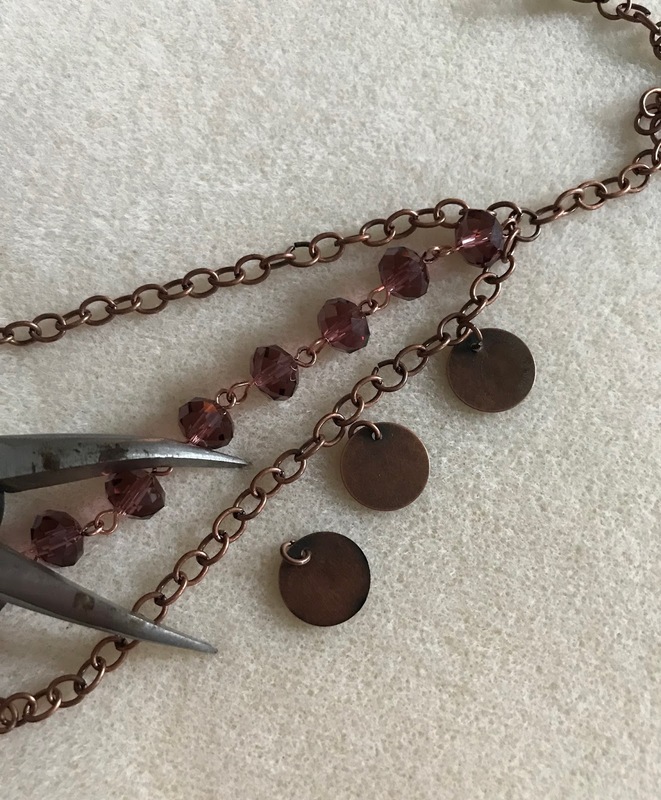 Use needle nose pliers to bend the pin back 90 degrees directly above the bead. 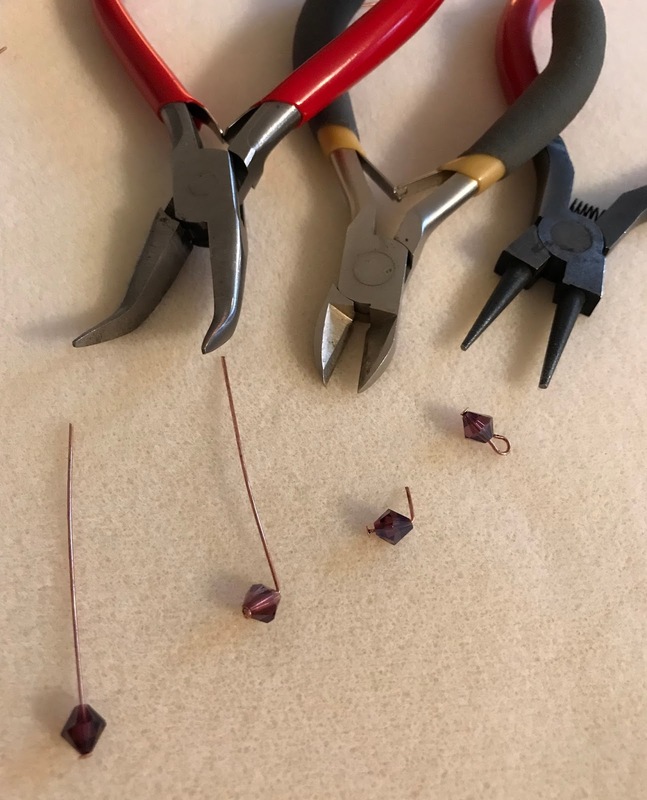 Use wire cutters to trim off all but about a half inch tail from the pin. 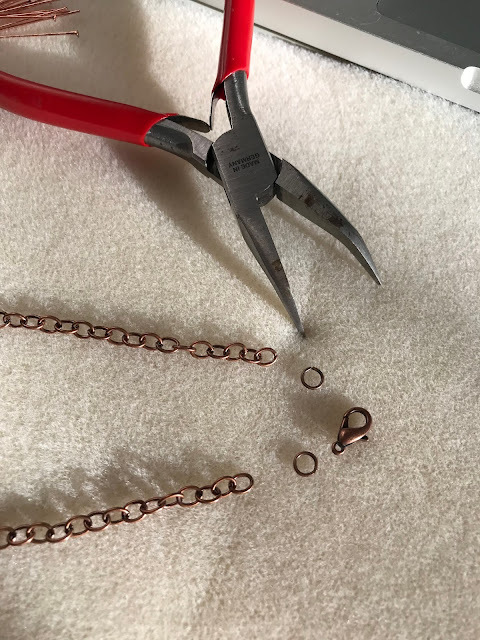 Grab the end of the tail using round nose pliers and then bend it back around the pliers to form a loop. Use wire cutters to cut four lengths of chain: one chain shorter than the rondelle chain and one longer and then two short piece of chain to connect the ends together. 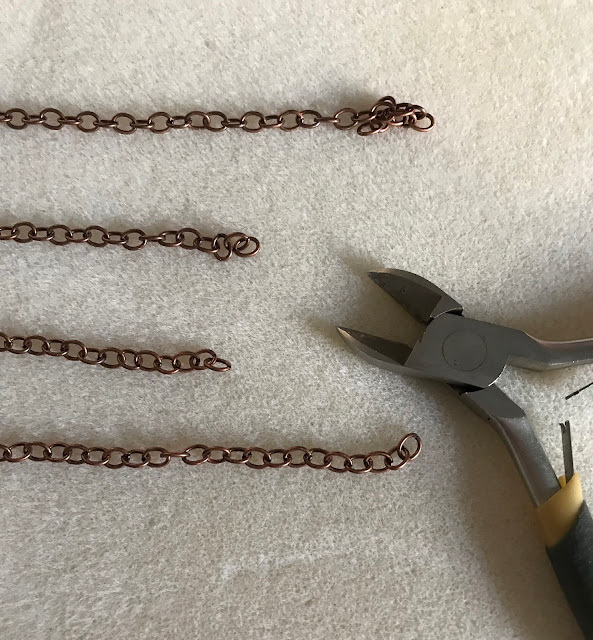 Use needle nose pliers to connect a jump ring to one end of the chain, and a jump ring to a lobster claw clasp on the other end of the chain. 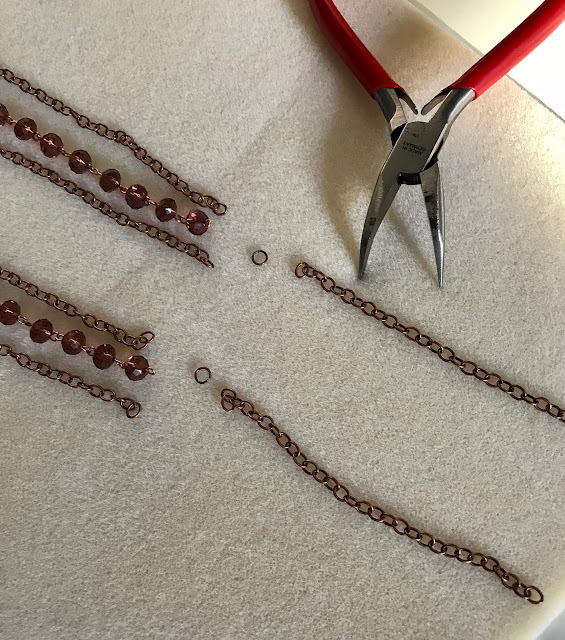 Grab two more jump rings and then connect the two end pieces of chain to the other necklace strands in length order. The should complete the structure of your necklace and then it's just time to decorate the other chain strands from here! Next create crystal charms using 6mm bicone crystal beads. String a crystal onto a head pin and then bend the pin back 90 degrees directly above the bead using needle nose pliers. 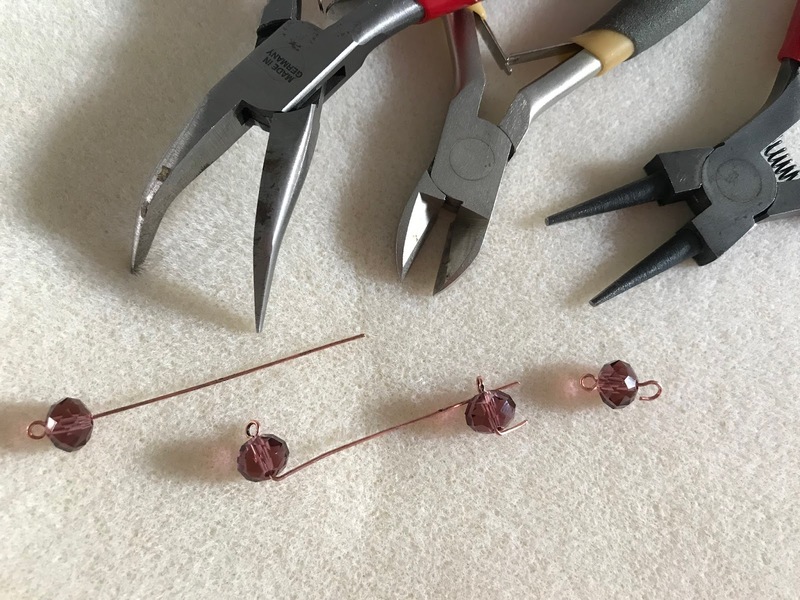 Use wire cutters to trim off all but a half inch tail from the pin and then grab the end of the pin using round nose pliers and bend it back around the pliers to form a loop. 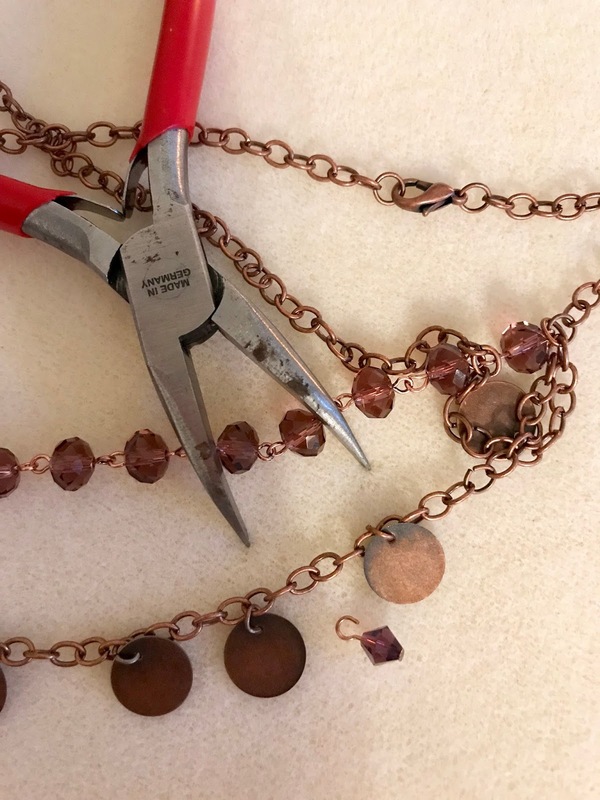 Connect these crystal charms to the copper chain in between the copper charm beads using needle nose pliers. 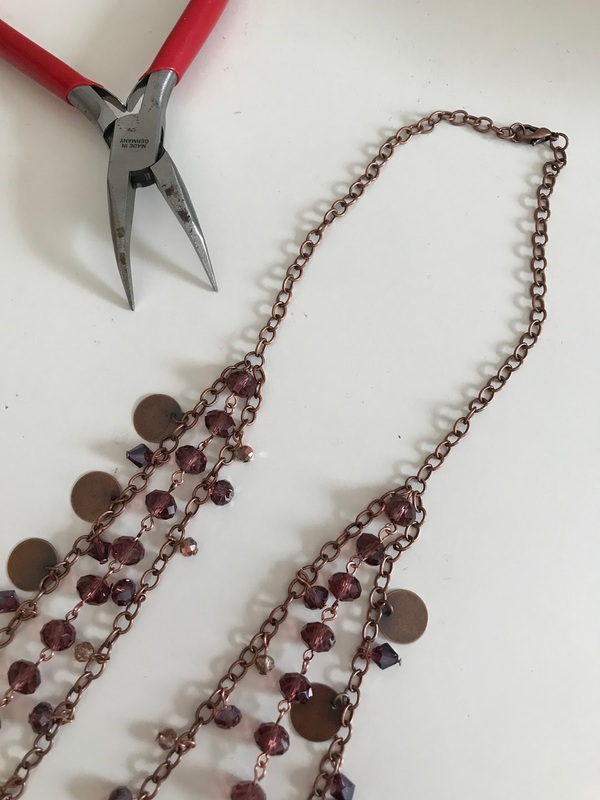 After all the chains were finished I had to connect the necklace back together again. 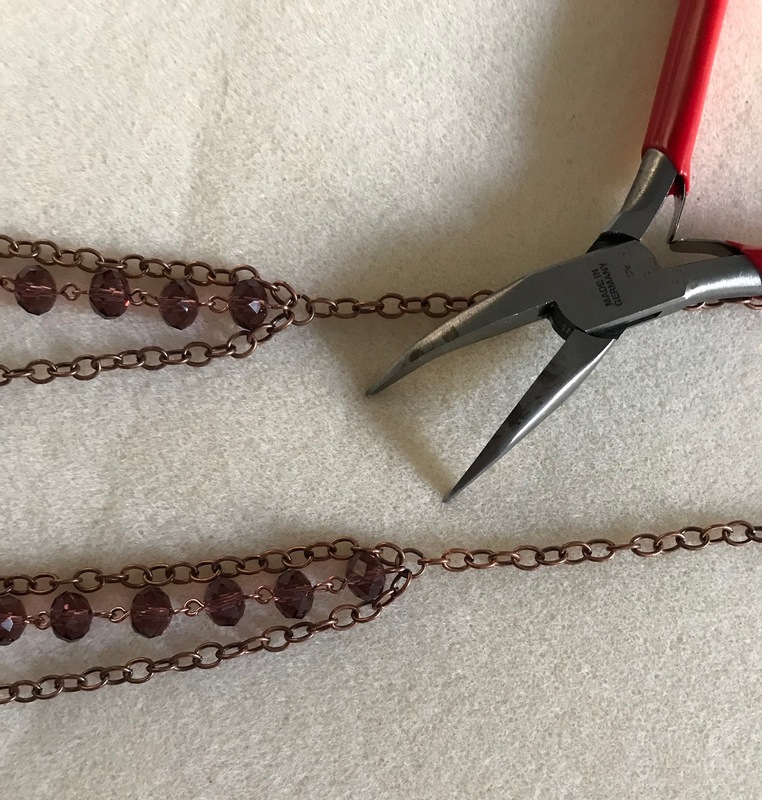 All three strands connected to a jump ring on each side of the short chain pieces attached to the clasp. 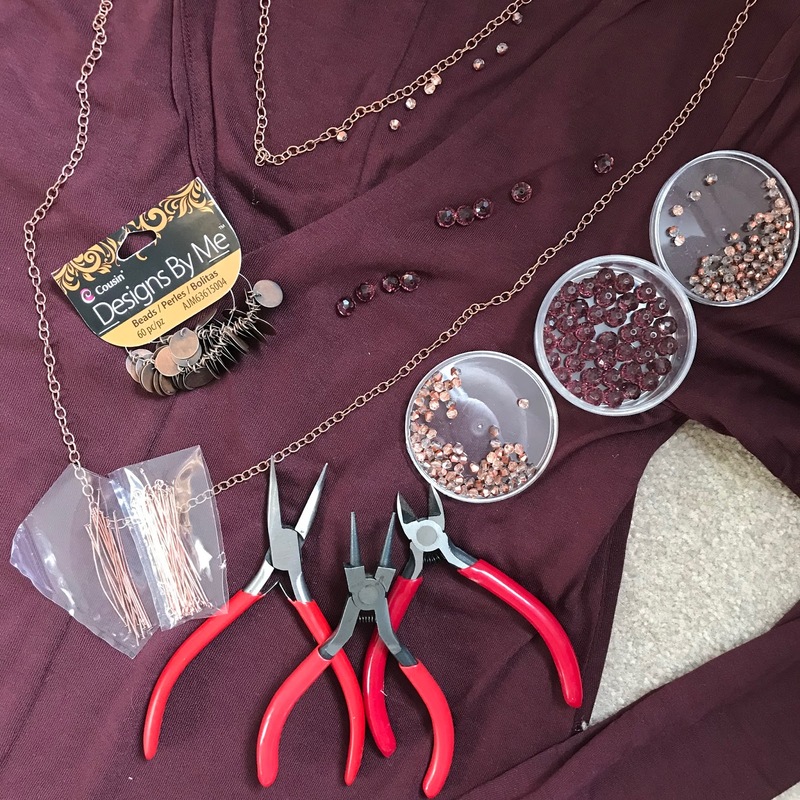 Squeeze the jump ring shut using needled nose pliers and your necklace is good to go! I love how it looks on! 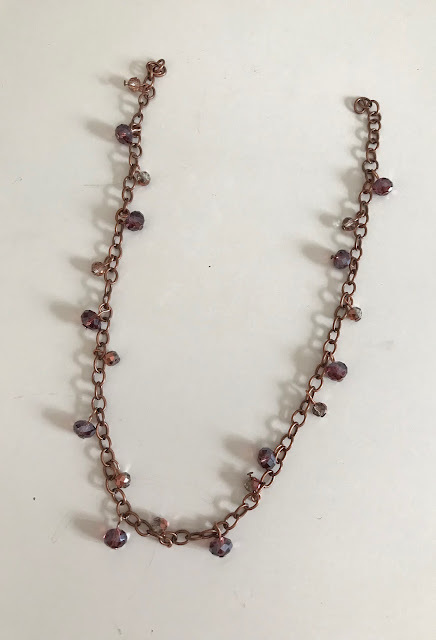 The purple beads match my dress but I also like how the copper charms and metallic AB finish in some of the small beads give it an extra accent color. thanks for sharing. Cant wait to try these. 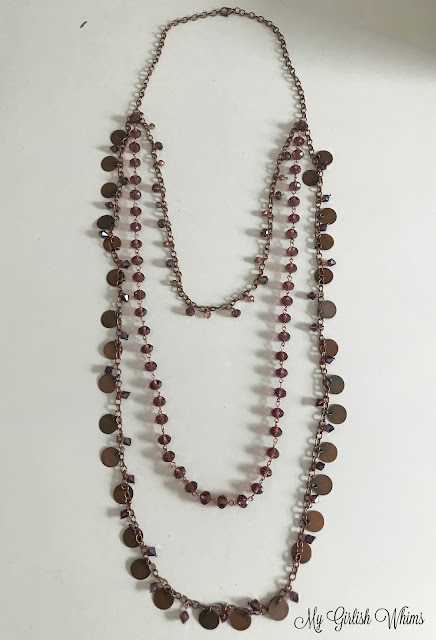 You guys should definitely check out this entry too. There are some really thrilling topics!